Hard and soft tissues are judiciously reshaped to expose more of your teeth. Once Dr. Kissel has exposed enough of your tooth root to obtain the desired cosmetic and functional qualities, he will then close the surgical site. New York City cosmetic periodontal surgery patients choose periodontist Dr. Kissel for crown lengthening because he is known for using microsurgery techniques, which reduces the risk of damage to your tooth root and jawbone, provides for a more precise, accurate procedure and makes your recovery time faster. Ensure a proper fit with the new crown or filling. Provide enough tooth structure so that the restoration won’t come loose in the future. Have easier access for brushing and flossing. Improve the aesthetics of the smile by helping turn a “gummy smile” into a smile with greater symmetry. 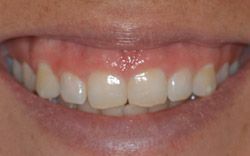 One of the reasons that dentists refer patients to Dr. Kissel is that he uses microsurgical techniques for many of his procedures, including crown lengthening. This approach reduces damage to roots and bone, improving your comfort and speeding your recovery. Before crown lengthening, Dr. Kissel will review your medical history and X-rays to plan your procedure. On the day of your surgery, you will receive local anesthesia to ensure your comfort. Dr. Kissel employs Wand® technology to deliver anesthetic pain-free. Dr. Kissel will use a microscope, which is the most minimally invasive technique allowing for maximum aesthetic results and faster healing time. The microsurgical techniques that Dr. Kissel uses are very precise, and so you can expect your mouth to heal quickly after surgery. You can manage discomfort with over-the-counter prescriptions, and Dr. Kissel will advise you to eat soft foods and avoiding brushing near the surgical site for a period of time. 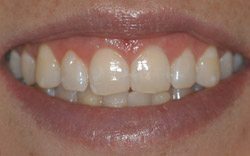 The results of a crown lengthening cosmetic periodontal surgery can be stunning and dramatic. Many New York City patients report that they feel more confident smiling and speaking with others after their crown lengthening procedure because they finally have a smile they can be proud of. Need a new crown or tooth restoration. Are unhappy with how prominent their gums are in their smile. For patients, crown lengthening exposes more of a tooth so that it is better able to support a filling or crown. This is particularly helpful in cases in which a tooth has chipped or broken. Dr. Kissel also offers the procedure as a cosmetic treatment, adjusting the levels of the gum tissue and bone to create a more balanced smile. New York City crown lengthening patients can get treatment for tooth restoration and cosmetic concerns. Schedule an appointment with Dr. Scott Kissel by calling 212-702-9088 or contacting us online today. Let Us Know How We Can HelpFill out the below form with any questions you may have and a representative from our office will contact you with any information you need.